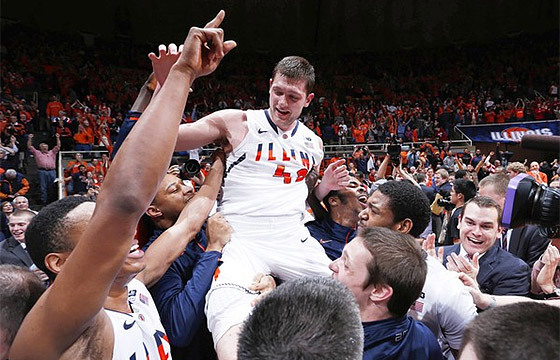 One way to get over the hump is to end your home losing streak with a win over Indiana. Who happens to be #1 this week… On a last second shot… After coming way back from behind in the last five minutes. It just so happened that the Hoosiers were ranked at the top this week – a happy coincidence of scheduling and other teams losing. They are not #1 (especially now), and certainly not the best team we’ve seen; that would be Michigan. But we’ll take it. If someone gets to knock the smirk of Tom Crean’s face, it might as well be Illinois!